HHSAA sends a big mahalo for all the hard work, time and financial assistance provided by all of our sponsors. We are thankful that these businesses have invested in the lives of Hawaii's young athletes. Atlas Insurance Agency is Hawaii's largest locally owned insurance agency, serving the people and businesses of Hawaii since 1929. Our leadership position in the insurance & financial marketplace provides us access to the most competitive products and services from over 40 national & local providers. We offer a full range of insurance to protect your Auto, Home or Business and also offer Benefits Consulting. Atlas Insurance Agency recognizes the importance of building a better community through its many community service activities and now Atlas is the new title sponsor for the HHSAA judo state championships! Passion for a better game. the HHSAA and look forward to being a part of the HHSAA’s successful future. Billy Tees' commitment to high school athletics is one of the most visible in the state and goes far beyond just one sport. Besides sponsoring bowling, Billy Tees designs and prints all of HHSAA's state championship tee-shirts as well as sponsoring six other state high school athletic associations around the nation. The Civilian Marksmanship Program proudly sponsors the HHSAA Air Riflery State Championships as well as youth firearm safety and training programs across the country. The CMP has spanned nine decades and continues to be at the forefront of developing skills and confidence in youth through marksmanship. The CMP offers one-year scholarship assistance to qualifying individuals who are currently enrolled in a team or club that is participating in rifle marksmanship competitions. For more information, visit thecmp.org/communications/cmp-scholarship-program/. Besides being a local business success story, Data House is one of the major components that keeps HHSAA running. 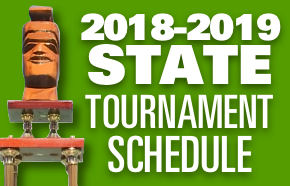 Data House provides HHSAA with not only a sponsorship for the state softball tournament, but they host our website and provide the tools we need to stay in close contact with the public we serve. The David S. Ishii Foundation was officially founded in 1999. Its mission is to promote and advance the game of golf, and to educate the public as to its benefits to society. In addition to sponsoring the boys and girls state golf championships, the foundation also provides college scholarships and financial aid for Hawaii’s junior golfers. Enterprise Rent-A-Car is very proud to sponsor the Hall of Honor and its 12 scholarship winners. We applaud the efforts of these outstanding student-athletes and are honored to give back to the community. From all of the Enterprise Holdings team (which includes the Alamo and National Car Rental brands) and our over 1,100 employees and 70 locations throughout Hawaii, we are very excited to play a part in supporting our Hawaii High Schools. First Hawaiian Bank is two things; the largest financial institution in the state and something you won't find outside of the Pacific So, it is fitting that they sponsor Hawaii's largest and most popular sport, football, and one that is unique to the island chain, paddling. Hawaiian Airlines is a proud supporter of HHSAA and sponsor of the Boys, Girls, and Mixed Canoe Paddling State Championships. Hawaiian® has led all U.S. carriers in on-time performance for each of the past 13 years (2004-2016) as reported by the U.S. Department of Transportation. Consumer surveys by Condé Nast Traveler and Travel + Leisure have placed Hawaiian among the top of all domestic airlines serving Hawai‘i. Hawai‘i Self Storage is committed to serving the people of Hawai‘i and giving back to our community. "Community Pride" represents our outreach into the community. We have established various programs focused on enhancing literacy, education, teamwork, support to local charities, and helping families in need. In 2009, Hawai‘i Self Storage was recognized by Inside Self Storage as one of the most charitable self-storage companies in the nation. At HMSA, caring for the people of Hawaii is our promise and our privilege. We’re proud to provide our members with the freedom to choose from thousands of the best physicians, providing access to high quality care statewide. We’re your long-term partner in health, starting with preventive care and education. Your local community is an important part of your total well-being, from finding care in your neighborhood to giving back through community service. That’s why we encourage health, learning, and volunteerism for high school students through our annual Kaimana Awards & Scholarship Program for high schools and seniors. HMSA is a member of the Blue Cross and Blue Shield Association. Nationally, HMSA and 37 other Blue Cross and Blue Shield plans provide worldwide coverage to more than 94 million members. In the footsteps of the king's runners. The Honolulu Marathon has been running for 33 years and with their sponsorship of the cross country state championships, they aim to keep Hawaii active for generations to come. We are proud to support the HHSAA and the cross country state championships. The lifetime fitness habits that are developed through participating in cross country are essential to the health and well-being of the future of Hawaii. Your total transportation services company. Track and field is one of high school's most wide ranging of sports, you have sprints, long distance running, throwing events and everything in between, much like their state championship sponsor; Island Movers. Island Movers calls themselves "Your total transportation services company" for a reason, they offer moving services, hotel renovations, storage and courier and armored car services just to name a few- almost as many choices as track and field. KAP7 is WATER POLO focused and began in the pool at a grassroots level in 2004. It is KAP7’s ongoing mission to help grow the sport the worldwide by directly supporting over 50 organizations around the world but primarily in the USA. A portion of every sale goes back to the sport through organizations such as USA Water Polo, American Water Polo, your state association or high school section, and the NCAA, and it is the official ball of the HHSAA state championship. New City Nissan, established in 1995, is the largest and number one selling Nissan dealer in Hawaii. New City Nissan is a proud supporter of many organizations in Hawaii, but has chosen the promotion of high school athletics as one its primary efforts in giving back to the community. New City Nissan’s involvement with athletics began in 2005 when it signed on to be the title sponsor of the HHSAA Girls and Boys State Volleyball Championships. In 2006, with the assistance of the OIA, ILH and HHSAA, New City Nissan created and began hosting the annual Goodwill Softball Classic – a four team tournament that features high school senior softball players from nearly every high school on Oahu. Starcomm Wireless is a locally owned 2way radio wireless communications company that has been providing reliable communications solutions and quality service since 1998. We specialize in new two-way radio sales & service, rental walkie talkies for your events, commercial GPS vehicle tracking and CCTV security camera systems. We are conveniently located in Honolulu at 275 Puuhale Road in Kalihi. Come in to our communication showroom or call us at 845-7827. We are ready to work for you! Proud to be the official 2-way radio provider of the Hawaii High School Athletic Association! Texaco is not only the proud sponsors of the Hawaii wrestling state championships, but they are committed to promoting "human energy" and no where else is human energy more apparent than in the grueling and intense sport of high school wrestling. Play hard. Be well. Queen’s Center for Sports Medicine. The Queen’s Health Systems has been dedicated to the health and wellness of the people of Hawaii for more than 150 years. With four full-service hospitals and seven health care centers, Queen’s delivers quality health care on Oahu, Molokai and in North Hawaii. The Queen’s Center for Sports Medicine provides comprehensive care for the treatment and prevention of injuries and illness related to exercise, fitness and sports. From treating ankle sprains to arm fractures, ACL tears and concussions, Queen’s sports medicine doctors and physical therapists are specialty trained and qualified to care for athletes, and active children, teens and adults. Queen’s is a proud sponsor of the Boys & Girls Soccer State Championships and the Hawaii High School Athletic Association. Snapple is a proud new Sponsor of HHSAA and the Girls and Boys Basketball Championship Tournaments. Snapple produces more than 40 flavors of Teas and Juice Drinks, all "Made from the best stuff on EarthTM.” Snapple is available at your favorite Hawaii Retailer in regular and reduced calories drinks in different packages. Best-selling flavors are Peach Tea, Kiwi Strawberry, Diet Peach Tea, Lemon Tea, Diet Half N Half Tea, and Apple. Explore our “REAL FACT” under every Snapple Cap and at https://www.snapple.com/real-facts. REAL FACT #221: The game of basketball was first played using a soccer ball and two peach baskets. Founded in 1990 by Stanford Carr, this locally owned business has become Hawaii’s most dynamic real estate development company. Stanford Carr Development is committed to giving back to Hawaii’s youth and proud to sponsor the HHSAA and the water polo championship. Wally Yonamine's name is synonymous with one sport, no matter which side of the Pacific you are on — baseball. Considered one of greatest lead-off men in Japanese baseball history, Yonamine has given so much back to prep baseball, it is no wonder he will be remembered as of the great sponsors in Hawaii high school baseball history. Zippy's, a house-hold name throughout the islands spanning four decades, returns to host yet another year of the prep cheerleading championships. The high-soaring action of cheerleading isn't the only flying Zippy's sponsors. Now, Hawaii's favorite restaurant services the entire nation with UPS shipping to the mainland. With gravity-defying action during the competition and hot, local grinds after, make your "Next Stop Zippy's."